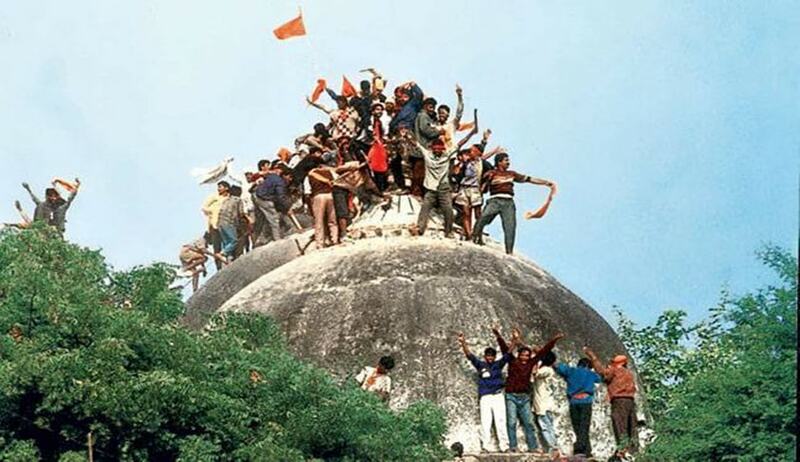 As the hearing in the Ram Janmabhoomi-Babri Masjid dispute resumed before the Supreme Court bench of Chief Justice Dipak Misra, Justice Ashok Bhushan and Justice Abdul Nazeer on Friday, senior counsel Rajiv Dhawan continued his submissions on the need to revisit the law laid down in Ismail Farooqui (1994) by a five-judge bench. He contended that the judgment in so far as it observes that “...this right (under Article 25) does not extend to the right of worship at any and every place of worship so that any hindrance to worship at a particular place per se may infringe the religious freedom guaranteed under Articles 25 and 26 of the Constitution...”, is wrong and has the effect of reducing the scope of Article 25. “Every Jain temple or Hindu temple or church or mosque of every religious denomination is entitled to be protected...and this particular mosque (Babri Masjid) was built in 1528 by a Mughal emperor and it was rebuilt by the British in 1935...it is not possible that this mosque cannot be protected,” he submitted. “We have perused the Quran and the Hadith. A mosque is to be a mosque forever. The observation regarding ‘comparative significance’ may apply only in cases of acquisition when it may be possible to say that the site of any specific mosque may not be acquired...,” he continued. Justice Bhushan observed that the Ismail Farooqui judgment does not make such a distinction. “The mosque in Mecca-Medina was built by the Prophet himself carrying each stone...such is the significance of every mosque or temple...I argue for every Muslim and every Hindu...the whole case rests on whether Your Lordships proceed on the position before (the demolition of the Babri Masjid) in 1992 or after...,” submitted Dhawan. “What is the ‘larger national purpose’? Is it a political agenda? It is what was stated in the BJP White Paper, in the introduction to which Shri LK Advani has favoured the building of a temple?...Lord Rama was born seven lakh years ago...where was the precise location of the birth?...,” advanced Dhawan. “The persons who demolished the Babri Masjid in December 1992 were no ‘miscreants’ (as referred to in the 1994 judgment), but they were two powerful ‘Rathayatras’...there was a joke before the Liberhan Commission (established to investigate the destruction of the Babri Masjid) that the calls of ‘todo, todo’ (to destroy) were actually calls of ‘chhodo, chhodo’ (to let be)...it was a strident, calculated and deliberate attempt to destroy the mosque and this must be accepted...,” he submitted. Thereupon, the senior counsel drew the attention of the bench to the judgment of Justice BK Mukherjee in The Commissioner, Hindu Religious Endowments, Madras v. Lakshmindra (1954). The Chief Justice remarked that it is a binding precedent. Dhawan responded that the said judgment has not been followed in Ismail Farooqui. He indicated the portion of the 1954 judgment wherein it has been observed that the right of a religious denomination to manage its own affairs under Article 26 is a Fundamental Right which cannot be infringed, while its right to acquire, own and administer property is subject to regulation by laws in the interests of public order, health and morality. In context of the right in Article 26(d) to administer property in accordance with the law, Dhawan commented, “Some limitations may be imposed, but it cannot be questioned if the mosque is really important to the community...only Eminent Domain may stand in the way of the Muslims...only the concerns of acquisition, limitation and title have to be considered...I agree with Mr. (Harish) Salve that this is a title dispute...”. “Ismail Farooqui does not say the mosque in unimportant...the phrase ‘comparative significance’ has been used to imply equal importance of the site for both Hindus and Muslims...,” observed Justice Bhushan. In so far as the 1954 judgment mentions “freedom or religious convictions genuinely entertained by men”, he remarked, “This goes to the heart of the ‘Essential Practices’ Doctrine’”. Further, Dhawan recited where the 1954 judgment observes that under Article 26(b), a religious denomination enjoys complete autonomy in the matter of deciding as to what rites and ceremonies are essential according to the tenets of the religion they hold and no outside authority has any jurisdiction to interfere with its decision. “Even the courts do not have the jurisdiction to state that in practising their faith, Muslims may pray anywhere,” he contended. Finally, he quoted from the 1954 judgment that a law which takes away the right of administration from the hands of a religious denomination altogether and vests it in any other authority would amount to a violation of the right guaranteed under clause (d) of Article 26. The apex court judgments in Mahant Shri Jagannath Ramanuj Das v. State of Orissa (1954) and Ratilal Panachand Gandhi v. State of Bombay (1954) were also relied upon. “... The free exercise of religion by which is meant the performance of outward acts in pursuance of religious belief...,” he quoted, remarking, “the outward expression of the Islamic faith is the mosque”. Thereupon, Dhawan discussed the Places of Worship (Special Provisions) Act of 1991. In the light of the definitions of ‘conversion’ and ‘place of worship’ in Section 2, he drew the attention of the bench in Section 3 on the bar that no person shall convert any place of worship of any religious denomination into a place of worship of a different section of the same religious denomination or of a different religious denomination. “Then the Parliament, in Section 5 of the Act, excluded the statute’s applicability to the Ayodhya dispute...,” he continued, clarifying that the said provision has not been challenged. “The placing of Hindu idols in the disputed structure on December 22/23, 1949 was a gross violation of the principle of secularism...the constitution was in force then...I do not mean ‘secularism’ in a scientific way but by way of equal treatment to all...then what happened in 1992 was a barbaric act...,” concluded Dhawan. The hearing shall resume on April 6.